While it certainly wasn’t one of the most traditionally exciting playoff series (Mike Moustakas’ extra-inning walkoff aside) in recent memory, last season’s NLDS matchup between the NL Central-champion Milwaukee Brewers and Wild Card-winning Colorado Rockies came with an interesting wrinkle: no two contending teams in baseball were assembled more differently. While the Rockies relied on a surprisingly strong young rotation to carry an unbalanced offense and underperforming bullpen to a playoff berth, Milwaukee propped up a shaky rotation with a strong lineup and a deep, dominant bullpen anchored by Jeremy Jeffress, Corey Knebel, and Josh Hader en route to a division title. But even these differences weren’t the most striking: Milwaukee led all of baseball in wins above replacement accumulated by players from outside the organization and generated very little value from homegrown players, while their Division Series foes lapped the league in production from early-round draft picks while receiving limited contributions from other player-acquisition avenues. 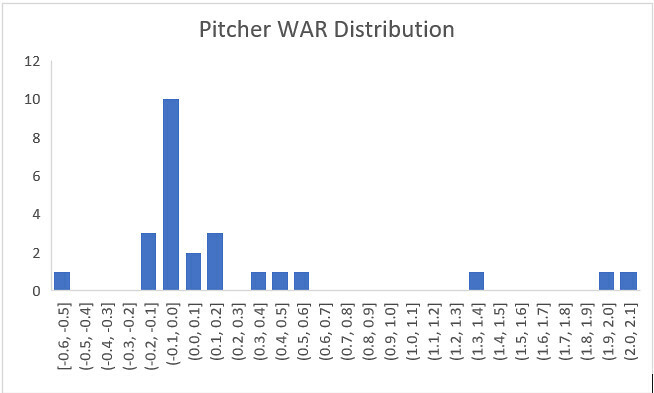 Every season, pitchers and pitching coaches across the league tinker with pitch arsenals, with varying effectiveness. This series examines the pitchers who have most significantly changed their arsenals in 2018, beginning with starting pitchers who have added new pitches. This season, a handful of big-name pitchers have added a new weapon to their arsenal, including Nationals ace Max Scherzer. Below, we’ll look at Scherzer and his pitch adding companions in detail, in order of their new pitch. As the table shows, Scherzer’s fastball, curveball, and changeup usage have remained about the same (as have the velocities on each pitch) while he’s shifted his focus away from his slider and towards his cutter. The new pitch is averaging 88.4 mph, a few ticks faster than the slider. 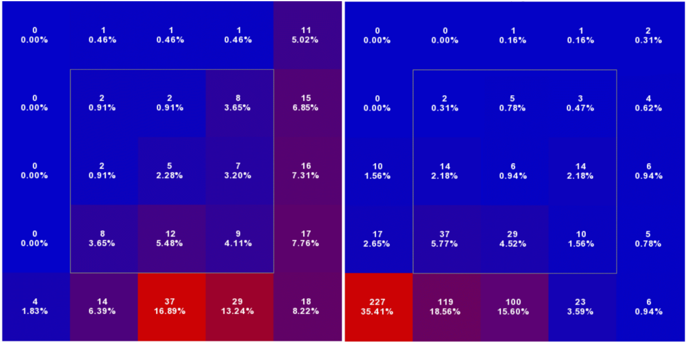 Scherzer’s located both pitches similarly, throwing both pitches primarily low and on the left-hand batter’s box side of the plate. The cutter (pitch usage chart below on the left) has been used more inside to lefties, while the slider (right) has been kept low and away to righties. However, there is one key difference between Scherzer’s cutter and slider usage: of the 242 cutters he’s thrown, only 7 have been to righty hitters, while only 3 of the 375 sliders he’s thrown have been to lefties. 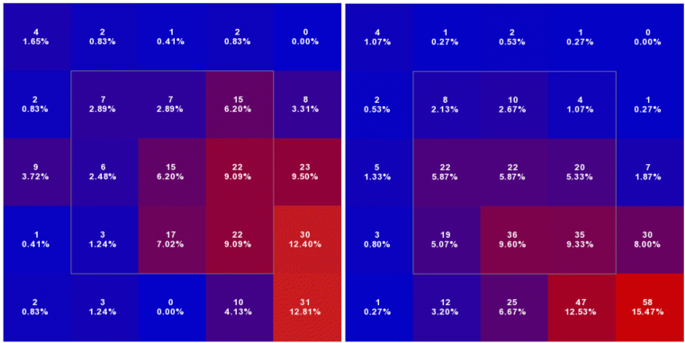 The development of his cutter has allowed Scherzer to avoid using his slider against lefties (who have slugged .368 off it career, compared to .270 vs righties) while keeping a four-pitch mix in play. While the pitch has only been about league average this season (with a weighted pitch value of 0.11 wCT/c), it may provide him a better weapon against lefties than his slider has. To this point, lefties have actually slugged .450 off the cutter this year (in a small sample), although they’re only hitting .183 against the pitch, and his overall line vs LHH is much improved this season (.189/.252/.349 with a .260 wOBA compared to .213/.299/.392 with a .299 wOBA in 2017). 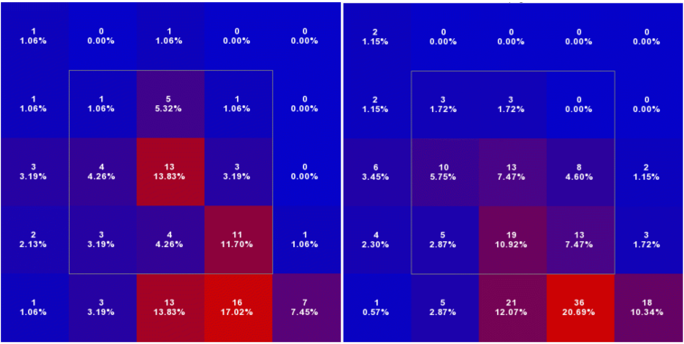 Only time will tell, but Scherzer’s been even better this season, and it may be in part due to his new pitch. Another NL fringe contending team’s ace, another new cutter. Martinez began tinkering with a cutter this spring and has carried it over into the regular season. The hard-throwing righty has turned the cutter into a significant part of his arsenal, ranking 26th out of the 148 starting pitchers to throw at least 50 innings this season in cutter usage. Martinez has shown one of the most drastic changes in pitch mix of any starter over the past two seasons, with the cutter being the largest catalyst for this change. As you can see in the table above, Martinez’s new pitch has largely come at the expense of his fastball, which has dropped in usage by 12%, marking the 3rd largest decrease in fastball usage between 2017 and 2018 of any starter in the sample. The Dominican righty has also leaned less on his slider since developing the cutter, which sits between 90-91 mph, about three ticks below his usual fastball and seven up from his slider. Martinez utilizes both a sinker and a four-seam fastball in addition to the cutter and uses each fastball in a different part of the plate. As illustrated in the pitch usage charts below, he tends to stick low and away (to a righty hitter) with the cutter (left plot), locates the sinker mostly down and inside (middle plot), and lives up in the zone with his four-seamer (right). Martinez’s newfound cutter (an above average pitch with a wCT/c of 0.73) has also given him a nice complement to his slider, which he primarily uses low and away to righties and down and into lefties, but as mentioned sits at a much lower velocity than the cutter. It is worth noting that Martinez has rarely used the cutter against righties but has, in fact, used it as his go-to pitch versus lefty hitters, according to Brooks Baseball. Thus far, CarMart’s cutter has been an effective weapon against southpaw swingers, who are batting only .220 with a measly .305 slugging percentage on the offering. Additionally, Martinez has done a much better job overall of handling lefties on the season, holding them to a .228/.350/.332 slash (good for a .307 wOBA) after allowing a .260/.342/.441 slash (.337 wOBA) to opposite-handed opponents last season. Although Martinez has taken a step back against righties this season (allowing a .301 wOBA in 2018 compared to .263 last year), it seems that Martinez has an effective new weapon in his arsenal. There’s a lot to unpack here, obviously starting with the cutter usage. Gray’s cutter usage ranks 17th in baseball among starters with 50+ IP this season, after not being utilized in 2017. As discussed earlier, the FB% is way down, as is the changeup usage, giving way to an increase in curveball frequency. Gray’s slider usage remains largely unchanged, holding steady in the mid-to-upper teens. In 2017, all of his pitches graded positively, with the slider standing out the most (1.06 wSL/c), but this season has been an entirely different story, with every pitch besides the curve (0.94 wCB/c) grading as below average and the cutter grading especially poorly at -1.77 wCT/c (to say nothing of the changeup, which has graded poorly but not terribly in the past, clocking in at -6.60 wCH/c, although small sample size should be noted here). There’s been plenty written about Gray’s struggles already this season, but it’s probably worth noting that his shift toward the cutter may not be helping him. Although it’s impossible to discern exactly how much of an impact the pitch has had on Taillon’s improvement this year, it is worth noting that the pitch ranks 18th among qualified pitchers in Fangraphs’ Pitch Value among sliders at 1.40 wSL/c. Although right handed hitters have had success against the pitch thus far (.263 BAA with a .491 SLG), the new pitch has devastated lefties this season, who are hitting a measly .160 with a .240 slugging percentage off the pitch. Taillon’s overall line against lefties is also much improved compared to last season (.321 wOBA this season vs. .355 in 2017), although it’s worth noting that Taillon’s numbers from last season are likely distorted by a rough second half following his return from cancer treatment. He’s also been more effective vs. righties and seen improvements in pitch value on both his fastball and curveball as well, possibly due in part to the new threat of his slider. After displaying strong talent and remarkable perseverance last season, Jameson Taillon has added a new weapon to an already strong arsenal en route to a very strong 2018 season. Corbin’s fastball (averaging 90.5 mph this season) and slider (81.6 mph) usage have remained largely the same, as the addition of Corbin’s curve has come largely at the expense of his changeup, which the lefty rarely uses. The new curve has averaged 73 mph on the season, coming in about nine ticks slower than Corbin’s primary breaking ball. Per Brooks Baseball, Corbin’s curveball seems to be of the 12-6 variety and has been used almost exclusively against opposite handed hitters, who have seen 218 of the 219 deliveries registered as curveballs by Brooks. Additionally, it is worth noting that over half of the curves Corbin has thrown have been to start an at bat, and that the pitch has resulted in the highest percentage of strikes of any pitch Corbin throws (although the slider isn’t far behind). Corbin has located most of his curves down and away to righties, further contrasting to the slider (below right), which the soon-to-be free agent has buried down and in against righty opponents. Although opponents have batted .294 and slugged .471 against the pitch in a small sample this season, it appears to be a more effective weapon against righties than the now-infrequently-used changeup, against which righty opponents have batted .339 and slugged .617 over the course of Corbin’s career. Corbin has also subdued righties much more effective overall this season than in the past, having held them to a .245 wOBA in 2018 compared to a career (including 2018) .324 line. It certainly seems plausible that Corbin’s shift away from changeups to opposite-handed hitters and towards early count curveballs (161 of the 218 curves to righty batters have come in 0-0, 1-0, or 0-1 counts) has helped him to more effectively dispatch opposite-handed opponents than ever before. Fangraphs’ Pitch Values also seem to offer support for his idea, grading Corbin’s curve as a positive pitch (0.38 wCB/C), whereas the changeup has graded as negative in every one of Corbin’s six seasons (with a net value of -2.27 wCH/C). Additionally, both Corbin’s slider and fastball have played up this year to the tune of career-best pitch values, possibly due to the threat of a third positive pitch against righty hitters. This has allowed Corbin to become a more well-rounded pitcher during an excellent season and helped pave the way to a potentially lucrative offseason deal. Data courtesy of Fangraphs and Brooks Baseball. Zone profiles all from catcher’s perspective, courtesy of Brooks Baseball. In instances where pitch type disagreements existed, Fangraphs pitch data was prioritized over Brooks Baseball. 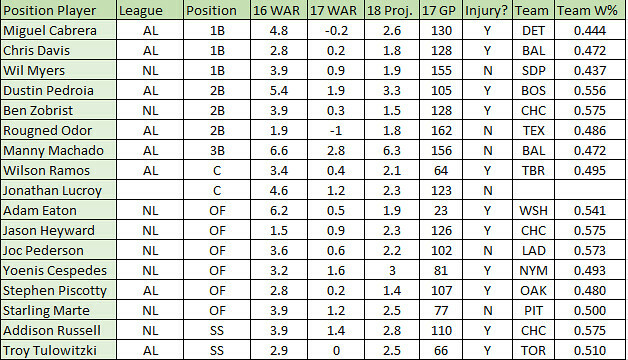 Pitch Mix tables based on Fangraphs data. While the race for the Comeback Player of the Year (CPOTY) award is nowhere near as fierce or publicly anticipated as the races for major awards like MVP, Cy Young, or Rookie of the Year, it’s still an award rich with history that recognizes some of MLB’s best bounceback seasons. Here, we’ll look at the history of the award, and use some of the trends in the historical data to identify some candidates for the award this upcoming season. In 1965, the Sporting News gave out its first set of CPOTY awards to Pirates pitcher Vern Law and Tigers first baseman Norm Cash. The award was created to recognize a player who “re-emerged on the baseball field during a given season,” although this ambiguous definition has led to some questionable selections (notably 2001 Ruben Sierra over Juan Gonzalez) and debate over what it truly means. The award is given annually to one player in each league, and is typically given to either a player returning from injury or one coming off a down season to return to a level of success previously achieved in their career. The award has been given by two bodies throughout its history, as the Sporting News presented it from 1965 to 2006, while MLB has given out the award since 2005. Over the life of the award, 106 total player seasons have been recognized, and a few players have won twice. Looking at a handful of trends within this sample allows us to identify what characteristics of player seasons correlate with winning the award, and therefore may allow us to formulate decent guesses as to what players might have a strong chance to contend for the award in the coming seasons. Some of the more important characteristics of CPOTY award winners include (but aren’t necessarily limited to) performance (both past and in the winning season), whether the player was injured in the season preceding their comeback, the player’s position, and team success. Let’s dig in and look at these trends to construct an ideal profile for a Comeback Player of the Year favorite, then look at what players might fit the bill in the upcoming season. Another way I evaluated performance was by looking at the differences in performance from year to year between the first two years (past success and down season) and the most recent two years (down season to comeback season). As expected, the first group saw a significant drop in performance while the second group typically saw a significant increase, often larger than the initial decrease. 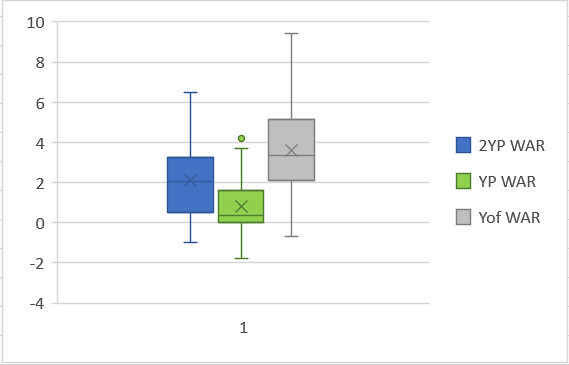 The following box-and-whisker plot shows the distribution of both sets of data, while the data table shows the mean and median values. So our ideal candidate will have put up at least solid value during their past success season, lost a significant chunk of that value the next season, and then experienced a big bounceback the following season, posting solid to excellent value. According to Steamer’s projections, there are 23 hitters and 12 pitchers (two relievers, 10 starters) expected to follow this pattern with a bounceback 2018. Since MLB took over the award in 2005, the trend has flipped entirely, with injury comebacks making up 73% percent of winners in that span. While there could be other complicating factors at play here, such as increased DL placements since the early days of the award, it still seems clear that suffering an injury during the preceding year has a strong tie to winning the award. As you can see, the award is most frequently given to starting pitchers, followed by first basemen and designated hitters. 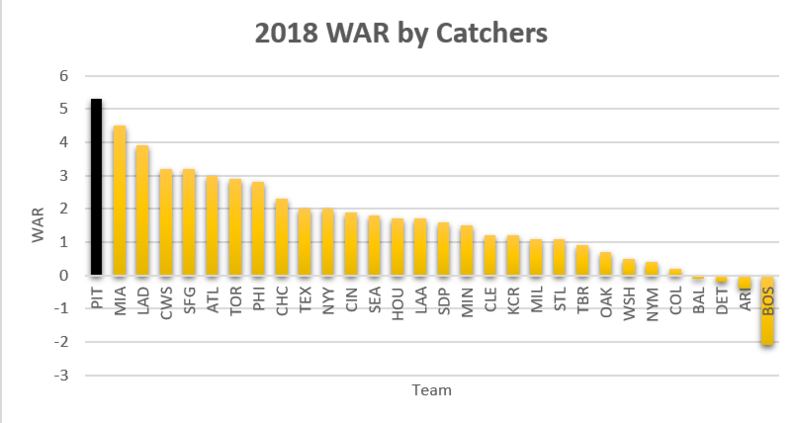 Middle infielders and catchers have rarely won the award, while outfielders, third basemen and (especially recently) relievers have received their share. Besides the dominance of starting pitchers, the most striking stat is the prevalence of designated hitters winning the award. While they make up only 11.32% of total winners, it is important to keep in mind that DHs have only been eligible to win 45 potential awards (the number of awards given in the American League since the establishment of the DH rule), so they have won 26.67% of the awards for which they have been eligible, a shocking number for players that only add value on one side of the ball. Possible explanations for the dominance of certain positions may lie in other factors. 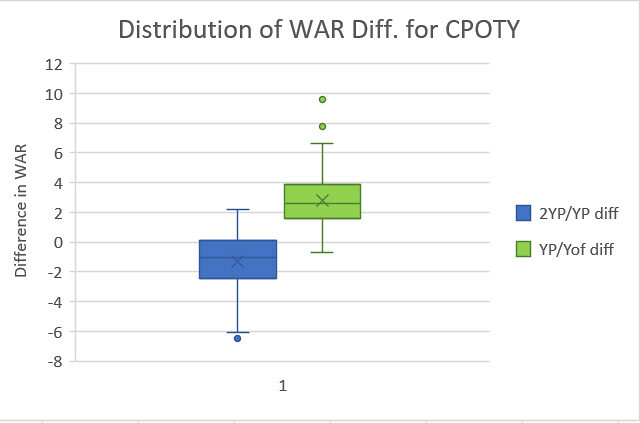 Since the award has typically been given based on offensive production without as much regard for defensive value, it makes sense that players at bat-first positions would win the award more frequently than those at defensively oriented positions. Additionally, catchers typically accrue fewer plate appearances than players at other positions, and therefore have less opportunity to accumulate shiny counting stats than designated hitters. Another possible explanation may lie in the fact that a history of prior success is typically a prerequisite to win the award, and that older players are more likely to have an extensive track record of success. Since the award leans toward older, more experienced players, the award is more often given to players at less valuable defensive positions because players tend to move down the defensive spectrum as they age, so more older players are occupying less valuable positions while younger guys handle the tougher assignments. There are certainly other possible explanations for this trend, but some combination of these factors may play a part in the trend of bat-first players winning the award. It may be tougher to explain the dominance of starting pitchers winning the award. It’s possible that pitcher success may be more subject to season-to-season volatility than hitters (while I haven’t been able to find any statistical studies proving this, it may be an interesting area of future research I’m considering pursuing). Another explanation might lie in the fact that every team typically rosters five starting pitchers and only one starter at each offensive position, but the difference seems stark enough at positions like catcher and shortstop that this seems unlikely. Maybe more pitchers suffer major injuries, causing them to miss significant time? There seems to be some credence to this theory, as only 13.11% of hitters played between 0 and 10 games in their down season, while 20.51% of starters pitched 5 or less games. It’s also possible that the sample still isn’t big enough and that this positional skewing is largely due to random variation. Whatever the case, it seems fair enough to weigh this trend at least a little bit going forward, so in predicting possible 2018 winners we’ll give the edge to starting pitchers, first basemen, and designated hitters. A final factor that has seemingly been of some importance in winning the award has been team success. While nothing about the award necessitates that the player plays on a good team, CPOTY winners have disproportionately come from winning teams. The following table displays some important statistics in terms of team success for award winners, most notably the mean and median team winning percentage, along with the percent of award winners playing on teams with certain win benchmarks. A .615 WP is roughly 100 wins over 162 games, .585 is 95, .555 is 90, .525 is 85, and 81 is .500. 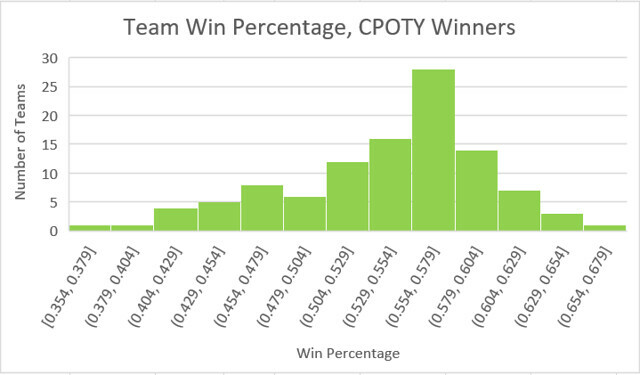 The data is fairly skewed left, with very few award winners playing on truly terrible teams and a very large portion of CPOTY winners playing for teams in the 89 to 94 win range. While it is true that there aren’t necessarily a ton of winners on elite teams, I think it might be fair to chalk that up to the fact that are simply less elite teams than just good teams, so it isn’t that players on elite teams are less likely to win, just that there are less elite teams than good ones historically. There’s no way to definitively answer why the award voting swings so heavily towards players on winning teams, but the data shows that this is indeed the case. Maybe voters believe that playing on a good team is part of a good comeback. It’s possible that players having bounceback seasons on winning teams are just more visible than those playing on teams going nowhere and therefore unfairly benefit in the voting. Another possibility is that voters are still relying on team-dependent stats like runs scored, runs batted in, pitcher wins, and saves, and guys on worse teams have less opportunity to rack up these stats. Perhaps there’s another driving reason, but clearly the award has historically favored guys playing on winning teams. After combing through the data, a few characteristics of CPOTY winners have stuck out. A pattern of solid value->drop in value->return to solid-to-excellent-value stands out, as does the recent trend of awarding the CPOTY award to a player returning from injury. An ideal CPOTY candidate would also play on a projected contender and be a starting pitcher, first baseman, or designated hitter. While a player doesn’t necessarily need to meet all of these criteria to win the award and there are some good candidates who don’t (Greg Bird, Mark Trumbo, Dansby Swanson, Alex Reyes, Carlos Gonzalez, etc. ), these characteristics have certainly been favored in the voting. Now it’s time to delve into the question of what players might have a good shot at taking home a comeback player of the year award next year. Just looking at the two lists, they seem like pretty good groups of names for CPOTY contenders. Davis, Cabrera, Machado, Ramos, Hernandez, and Price especially stick out in the AL, while Eaton, Syndergaard, Cueto, Bumgarner and Cespedes seem like good bets in the NL. Personally, I’d lean towards Syndergaard in the NL and Machado (or Cabrera if Machado is dealt to the NL) in the AL. It’s certainly possible that the award winners this year don’t come from these lists, but based on historical trends, these 29 players seem like solid favorites to take home the Comeback Player of the Year award in 2018. FanGraphs leaderboards and player stats, Baseball Reference Player Pages, and Wikipedia for injury new were heavily used to do research for this post. About 12 hours apart, news of two very similar moves broke out of Chicago and Minnesota, as the Cubs agreed to terms with Drew Smyly while the Twins signed Michael Pineda. Both pitchers inked two-year deals with $10-million guarantees and additional incentives based on innings pitched, but the two deals shared an even more important similarity: both pitchers underwent Tommy John surgery this summer and seem unlikely to contribute significantly during the 2017 campaign. 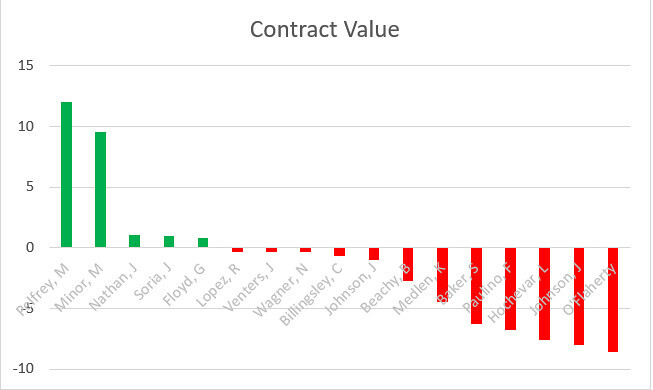 Both clubs are clearly betting on a return to health and productivity in 2019 for the two still relatively young pitchers, as evidenced by the financial distribution of the contracts. Pineda is only owed $2 million for the upcoming season but will receive $8 million in 2019, while Smyly will be paid $3 million next year but will pull in $7 million the following year. Since both pitchers underwent surgery around the same time, during the middle of the summer, it seems unlikely that either will throw pitch in the coming season. While uncommon, these types of deals certainly aren’t entirely unprecedented. The Kansas City Royals have inked three pitchers with similar situations over the past few years, with varying degrees of success. These contracts, given to Luke Hochevar and Kris Medlen in 2015 and Mike Minor the following season, seem to represent the most relevant examples of such a deal. While Minor was non-tendered by the Braves following repeated shoulder issues, both Medlen and Hochevar underwent Tommy John surgery the previous year. All three pitchers would appear for the Royals in the major leagues over the life of their deals, albeit with differing results. Hochevar would appear in 89 games for the Royals, and accumulate only marginal value, as he posted a FIP around 4.00 and tallied only 0.3 WAR combined before succumbing to thoracic outlet syndrome surgery. Kansas City declined their option over Hochevar last winter, who became a free agent and sat out 2017 recovering. Medlen would also return to pitch in 2015, making eight starts and seven relief appearances for Kansas City. He saw an uptick in walks and a downturn in strikeouts compared to his previous work, but overall pitched his way to a 4.01 ERA with similar peripherals and rang up half a win of value. 2016, however, would not be so kind to Medlen, as he was shelled to the tune of a 7.77 ERA while walking more batters than he struck out and battling a shoulder injury. He would sign a minor-league deal with the Braves after the season, but would not return to the majors. Although he did not appear with the Royals in 2016 after struggling in AAA, Minor marks the largest success story of the three. Over 65 relief appearances, Minor registered a 2.62 FIP and was worth 2.1 WAR out of the bullpen. He recently signed a three-year contract with the Rangers to return to a starting role. In total, the Royals invested $25.75 million in the three pitchers and saw them accumulate a grand total of 2.9 WAR, with most it coming from Minor. This works out to a $/WAR figure of $8.88 million per win, which is slightly higher than the $8 million per win value assumed of the free-agent market. Based on these three deals, it would appear that this type of signing is not a bargain, but rather an overpay on average. However, it isn’t fair to make such an assumption without looking at a larger sample of data. If we classify a similar deal as one in which a team signed a pitcher that was injured at the time of the signing and expected to miss at least part of the following season and either signed a major-league deal or a two-year minor-league pact, that leaves us with 18 similar signings since 2007. One of these signings, Nate Eovaldi, has yet to return from his injury but should in 2018, so we won’t include him in the sample. As you can see, only five such contracts actually generated positive (above market value of $8 million per win), while the remaining 12 contracts provided their team with below-market value. The mean loss per contract is $1.34 million, while the median is represented by the Phillies’ $700k loss on Chad Billingsley. While neither number is outrageously high, both figures only serve to reinforce the fact that teams have generally lost more often than they have benefited from inking an injured pitcher. None of this is necessarily to say that the Pineda, Smyly, and Eovaldi contracts are doomed or that no team should ever make this type of investment, but simply to look at how similar deals have worked out in the past. Admittedly, the sample is hardly big enough to make any sort of definitive conclusion, but the overall trend on these “bargain” signings isn’t pretty. Both Smyly and Pineda are better pitchers than most in the sample, so it is entirely possible that they (along with Eovaldi) could significantly shift the outlook on these types of deals in the future. Whether this trio of pitchers can buck the trend or will follow in the footsteps of their predecessors will certainly be an interesting, if minor (pun intended) storyline to watch over the next few seasons. FanGraphs.com leaderboards, Baseball-Reference transaction data, and MLBReports Tommy John surgery database were all used extensively for this research.